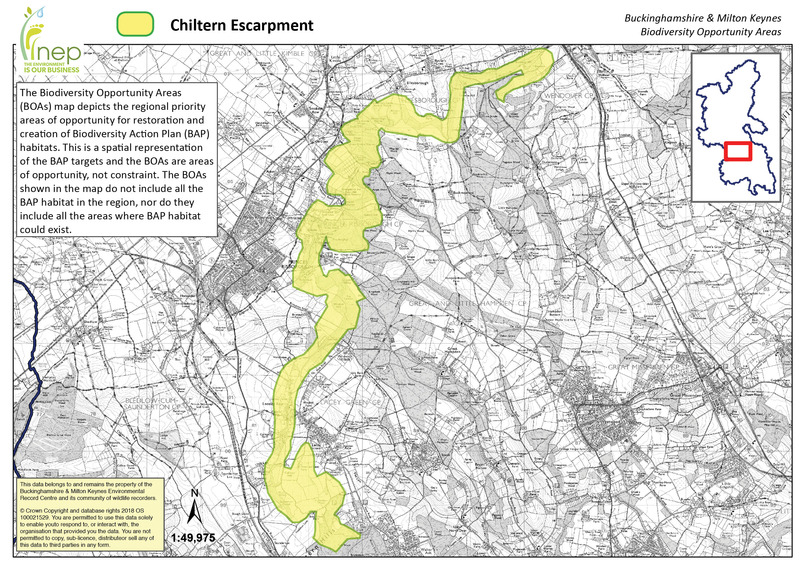 The steeply sloping Chilterns Escarpment runs from Wendover to Bradenham and contains many calcareous grassland and woodland SSSIs. It is adjacent to the Dunsmore Woodlands and Radnage Valley BOAs. Calcareous Grassland – There is Calcareous Grassland in many SSSIs including Bacombe and Coombe Hills, Ellesborough and Kimble Warren, Grangelands and Pulpit Hill, Windsor Hill as well as on LRS such as Brush Hill and Whiteleaf Cross and LWSs. There are no large contiguous expanses of calcareous grassland however and most sites are isolated from each other by other habitats. Woodland – There are several woodland SSSIs Ellesborough and Kimble Warren, Grangelands and Pulpit Hill, Windsor Hill, Bradenham Woods and other BAP woodland on LWSsWood. Pasture & Parkland – Chequers offers parkland habitat. Parts of Giles and Ninn woods are managed as wood pasture. Chequers is a registered historic parks and garden. There are 8 scheduled ancient monuments all in the northern half of the BOA.